(TibetanReview.net, Nov28, 2017) – After being postponed “at least until the winter break”, the schedule of China’s under-20 football team to play a series of weekend friendly matches with 15 more fourth-division teams in Germany stands cancelled due to dispute over Tibetan flag displays. A Chinese-language commentary in China’s sole ruling party’s mouthpiece, the People’s Daily, called the flag displays during the only match the team had played, marred by a walkout, on Nov 18 “an insulting slap in the face”, according to a report posted on the official en.people.cn Nov 27. The Chinese under-20 team will now return home, reported the AFP and others Nov 27. The team was to play a series of friendlies against German fourth-tier sides as part of a project to improve China’s chances at the 2020 Tokyo Olympics. 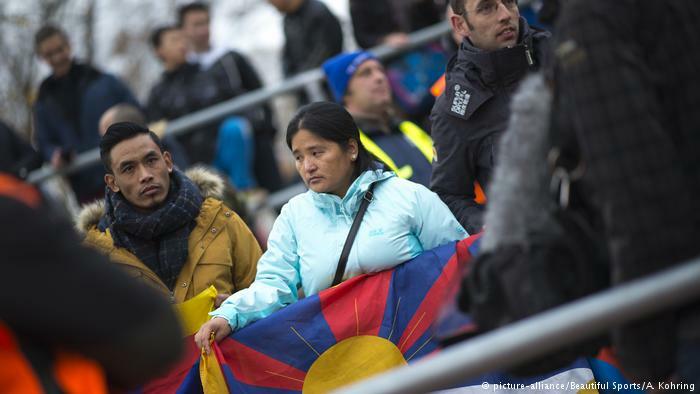 But the team walked out from the very first match, which was played in Mainz, on Nov 18 when six activists from the Tibet Initiative Deutschland – four of Tibetan-origin and two Germans – displayed Tibetan flags from the spectators’ stands. The team returned to the field after about 20 minutes after the protesters were convinced to remove their flags. But Tibet activists made it clear they would continue to display Tibetan flags wherever the Chinese team would play. The Chinese side, including its foreign ministry, insisted that Tibetan flag displays should be stopped and dealt with while German footfall officials insisted that the country’s democratic ethos and respect for human rights did not allow any such prohibition. However, on Nov 26, its Chinese counterpart, the CFA, added: “It has been decided to pause the U20 project and arrangements have been made for the team to return home,” reported the AFP. China forced Tibet to sign an unequal treaty in May 1951 and then fully annexed the country in Mar 1959. China claims to have liberated Tibet and calls it part of Chinese territory since ancient times despite the stark differences in the two countries’ ethnicity, culture and way of life.